Rest is not idleness, and to lie sometimes on the grass on a summer's day listening to the murmur of water, or watching the clouds float across the sky, is by no means a waste of time." There are few certainties in life, particularly those things in which man has a part. Change is all around us with technology, advances in science and medicine, in social, cultural and political settings and also in the environment. But there is something that is certain in life, and that is that Mother Nature brings a new day with the setting sun and the dawn of each new day. Despite our busy lives, she has a significant part in this sequence of time, which brings vigor every morning but also the need for rest and then rejuvenation at day's end. And somewhere in the midst of things lays the beauty and sanctity of the gardening world. This is what the Victoria County Master Gardeners aim to share with the community through educational activities. Some are time specific, and others are ongoing. This column, having been published each and every week for a full decade (522 original, never-repeated articles), has been an ongoing source of education not only for those of us who have voluntarily written it but hopefully also for those who read it every Thursday - and now Friday - in print. This is not to overlook weekly online postings as well as the archival of all articles since inception of the Master Gardener website, vcmga.org. Last week, the Master Gardeners of Victoria County took a serious look at the commitment to renew that effort yet another year, and this article, the first week in July as in years past, begins a new year - and day - in the life of the column. It has somewhat become a certainty for the membership - and in my life - each week over the past decade as its editor. So, as has been my custom for the past nine years, I announce the renewal of the column for another year, a decade plus one. Taking the time to listen to and watch the beauty of nature in reality and through the column has provided great calm to me personally as time has brought significant change with the passing of a generation and added responsibilities to my already busy world. I, for one, am grateful for the gift of nature that has nurtured a sometimes heavy heart through time. The timing of this column renewal also always falls on the week surrounding the Fourth of July, and it has become my custom as a known flag waver to share plantings of red, white and blue in my garden. 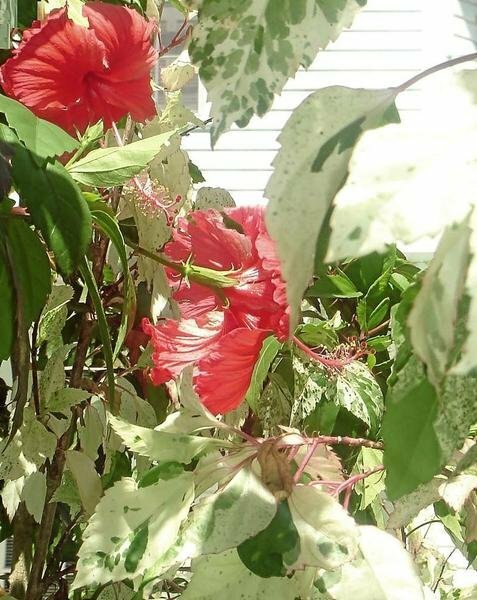 With a variegated leaf that often has more white than green, the Snow Queen hibiscus has thrived for more than two decades in a corner of a somewhat protected poolside bed. It blooms abundantly beautiful red flowers and is cut back after freezing in the winter to a few inches but has reappeared each spring and climbed into the heat of the summer to 8 and 10 feet tall, which is well above the norm. Recent rains have obviously added to its happiness in its location in direct sun. 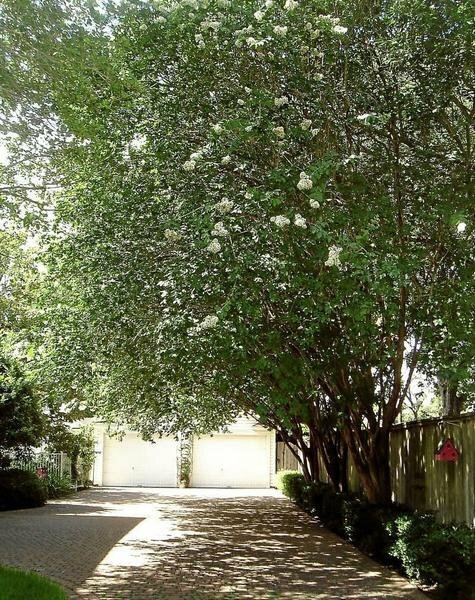 The row of Natchez white crepe myrtles lines the lengthy driveway with a canopy overhang that provides much-desired shade in the summer heat. These trees, too, have thrived for almost 25 years with care in pruning and proper irrigation. The bark strongly exfoliates with an unusual cinnamon color on the trunk and stems. Known as the Lily of the South, it blooms hundreds of delicate, cooling white flowers from June to September. Care is taken not to murder the myrtles in pruning season with their vibrancy at 25 to 30 feet tall this time of year, indicative of their happiness in their location in the garden. 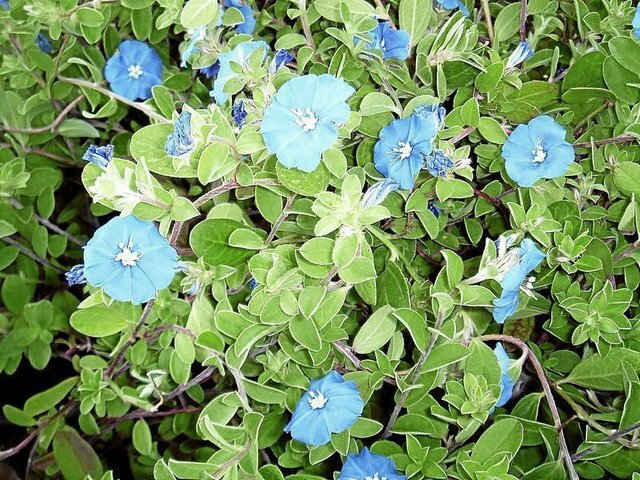 'Hawaiian Blue Eyes' blue daze is an herbaceous evergreen that thrives in bright sun to partial shade as a border plant in several beds with true blue, 1-inch blooms and white throats. At 1-11/2 feet tall and 2-3 feet wide, this low grower tolerates the heat well with adequate water and well-drained soil. Its abundant flowers are short-lived, lasting only a day, opening in the morning and closing in late afternoon and on downcast days. These three are several of various patriotic plants combined with similar-themed garden decor that exist in my garden not only for patriotic holidays but also year-round. If you have an extended Fourth of July celebration planned, stay cool and safe this weekend, always remembering that taking a rest in the garden is not idle; rather it is good time, and in fact, can be therapeutic for a patriotic heart.